Achla Garden Obelisk, Graphite, 61.5"
Add dynamic style to your garden with the Achla Garden Obelisk. Placing such a structure in your landscaping brings attention to the area, while helping to support your favorite flowers. Four upright metal rods create a frame, with three rings along the body add sturdiness to the piece. Each of the rings has a progressively smaller diameter, and leaf shapes on the legs keep them in place. These flat metal rings add a geometric feel to the unit, while helping support climbing plants. A conical cap with orb finial completes the piece, and remains securely in place with two pegs which insert into the top of two of the hollow legs. Each side rail has a pointed foot, to insert into soil in moments, and cross bars at the top and base of the item keep it stable. Place the obelisk in your landscaping above a climbing plant, and train it to grow upward rather than outward by weaving tendrils around the rails. The item can also make a grand statement indoors, by placing it in a pot or planter larger than 12" in diameter. The graphite color creates an elegant look, while its metal construction and powder coating keep it robust. 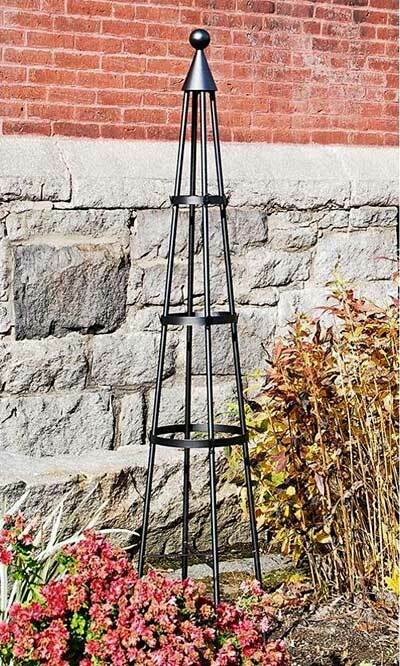 Bring style into your yard or home using this Garden Obelisk. Some assembly required. Gardman Nature Metal Pot Obelisk, Brown, 47"